Clicks: Since you only have 140 characters to work with on Twitter, using a URL shortener is essential, especially given the fact that posts between 100-120 characters are far more likely to be re-tweeted (RT). Fortunately, nearly every URL shortener – whether you are working from our Twitter Client or a third-party social dashboard – gives you the opportunity to track the number of clicks each tweet receives. This KPI is useful as reviewing which tweets are most popular will help inform your content strategy moving forward. Re-tweets: Similarly, measuring the number of re-tweets your posts receive is a great metric to evaluate your messages’ reach and will help you refine your posting strategy on-the-go forward. Paying attention to the times your tweets are most re-tweeted will help you determine when to schedule your messages. Mentions: The amount of mentions (@) your handle receives is another engagement KPI that reports on your messages’ reach and relevance. Have in mind that the number of re-tweets your messages receive may overlap with the number of mentions you acquire, as users that edit a tweet before re-tweeting will fall into this category. 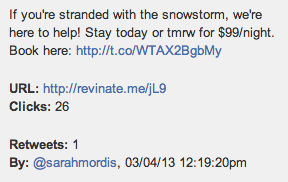 Revinate clients can easily track the number of mentions their properties receive from our Twitter Client. Referral traffic: Traffic that your website or blog receives via tweets should be measured as part of your KPI evaluation. Google Analytics not only allows users to see how much social media traffic your website receives by segment, but also gives users the chance to learn more about these visitors and see how they behave on your site. Keeping close track of these KPIs is a jumping off point when starting to evaluate your performance in the space. Remember, however, that the main objective of your Twitter strategy show focus on creating and sharing engaging content, not merely just acquiring more brand mentions and re-tweets. If your content is interesting, these KPI improvements will follow.